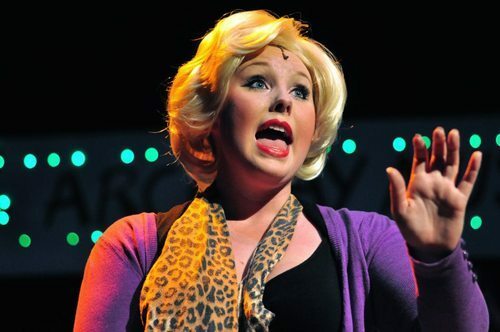 Meet the Cast: Patty Simcox! "She thinks she is popular but everyone finds her irritating"
Introducing Patty Simcox played by Emma Hough! Tell us a bit about Patty: She’s the overly enthusiastic head cheerleader running for President of the Student Council. Thinks she is popular but everyone finds her irritating. She would also like to get her paws on Danny Zuko. What’s your favourite Song in the show and why? : ‘Those Magic Changes’ - I just can’t help myself singing along, especially when Freddie sings it so beautifully. What other shows have you done: This is my 8th show with Simply. (clearly can’t get rid of me) Some of the shows include, Little Shop of Horrors (Audrey), Spring Awakening and most recently, Into the Woods (Little Red Riding Hood). Best or Worst moment onstage: Whilst playing Audrey in Little Shop of Horrors, when the character eventually dies I leant back and my wig fell off. Completely ruining the emotional death and causing lots of giggles. Interesting Grease Fact #17: Susan Buckner who played Patty in the film was originally considered for the role of Sandy and Directors had pretty much offered her the part, when Olivia Newton-John turned up!